I've come to understand that fear is the mother of all limiting beliefs. All limiting beliefs, no matter what you call them- insecurity, low self-esteem, sabotaging success, are all just extensions of fear. “I’m not smart enough”, “I don’t have enough education”, “I’m not that talented”, “She’s much more attractive than I am”….. . I was having a conversation about fear with some family members at a graduation get together the other day. We were talking about going through tough times and how during those times it seemed that negative things just keep piling up on you. I was saying that there have been times when I felt under siege, like I was living in the Führer bunker. My mother said "Oh, you were living in the fear bunker"? She really didn't hear me correctly but I said yes! Exactly! I was in the Fear Bunker! That's what it really was- a fear bunker. I was hiding out in my bunker. But I wasn't really hiding or barricading myself in anywhere. I was still living my normal day to day existence. But I was definitely in fear mode and when fear takes over, things change. Because circumstances can change and sometimes very quickly: you lose your job, you breakup with your mate, you have financial problems, you owe money you can’t pay. These are all things that most, if not all of us, have been through. But when you are living in fear, negative things seem to expand and increase. Bad news seems to find you. And you find yourself pin balling from one negative thing to the next. After a while you begin to feel beat up. It’s no wonder that we batten down the hatches and move into the bunker. Fear contracts you. It shuts you down. You pull in. You are in retreat, in survival mode. You are consolidating, not stretching out. This is a non- creative state. You are no longer open and looking out, you are afraid and looking over your shoulder. because sometimes living with problems is easier than living with solutions. Don’t we all know someone who lives in constant chaos, who is constantly up to their eyeballs in problems and seems pretty happy about it? But you can't win battles by being in constant retreat. 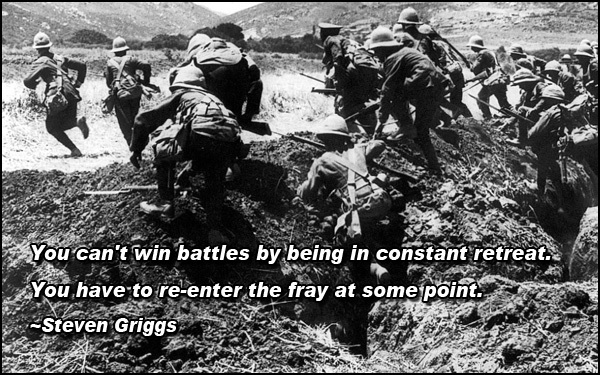 You have to re-enter the fray at some point. Yes, there is a time for retreat, a time for regrouping, for consolidating. And then enough is enough. You begin to remember who you are, that this isn't the real you. It doesn't matter if you allowed yourself to become a victim for a while. It was a step. The point is you remember. You stop. You stand up. You remember that there is nothing anyone can really do to you. You remember that 80% of the things you are worried about don’t happen and the 20% that do aren't as bad as you thought. And really, what’s the worst thing that could happen? Lose all your money? You can make more. Lose your home? You can find another. Lose your job? Find another way to make money. Creditors chasing you? Change your phone numbers. You can deal with them later. It's an individual thing. We each know when we've reached the end of our penance, when our time of retrenchment is over. So come up out of your bunker and smell the fresh air. It’s time to start making a plan.